Quicken online backup is possible via native Quicken backup utility, however, the functionality of this solution is somewhat restricted, and the cost is very high. To backup Quicken online, user can apply third-party solutions, such as Handy Backup, well equipped for this job. 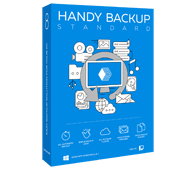 Handy Backup has a native Quicken online backup support, as well as tools for backup Quicken online to different cloud services including Amazon S3, Google Drive and other resources including own secured vault called HBdrive. This utility allows Quicken backup to local drive or to specialized Quicken cloud backup account, with an annual fee starting from $9.99 per 100 MB and up to $149.99 per 15 Gb archive. It allows full backup only, with encryption and notifications as extra options. Although the native Quicken online backup tool is a secure and sturdy solution, lack of common backup features and the significant price for online storage service can make problems for some users requiring inserting Quicken backup tasks to some common backup strategy. How to Back up Quicken Using Native Backup? To use Quicken online backup support from the native tool, you must register an account on a Quicken cloud backup service. Before making a backup, you must enter your login and password. 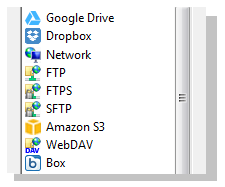 Then select a destination for saving your data (cloud or local drive) and start backup. Being compared with native Quicken utility, all editions of Handy Backup can support almost any cloud service existed (including, but not restricted to, Quicken cloud backup). This can have a financial impact, e.g., the 15 Gb of space at Google Drive is free, compared with $149.99 for Quicken. Scheduling, compressing, encrypting and notifying as parts of the standard option kit. Applying these features along with many other control options provided by Handy Backup, user could make a strategy of saving crucial data from Quicken or any other sources, no bothering about difficulties, security troubles, or extra annual fees required. Easy-to-use PC backup utility that automatically backs up all important documents and your favorite applications. Handy Backup has a standard option for performing Quicken online backup. All Quicken backup data can be added to backup task literally by the two clicks, using the standard “Computer” option as the data source for the backup task. You may select any destination for Quicken backups. Create a new Handy Backup task. Find the “Computer” option at the Step 2 (data selection). 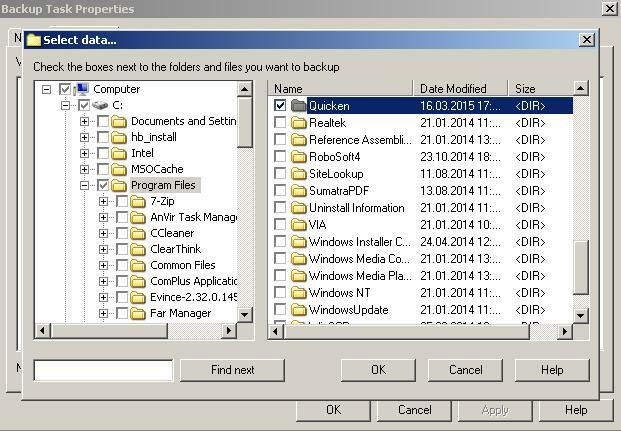 Find the default Quicken folder and mark it with a checkbox. Then press OK and return to the backup task creation wizard, proceeding creating a task as usual. Using Handy Backup for Quicken instead of native tool can save efforts for keeping data, reduce Quicken online backup cost and organize Quicken data management as the part of overall strategy of safeguarding. Try Handy Backup just now for a 30-days free trial!